A beautiful wedding reception taking place in the broad sunny garden in front of La Selva Giardino del Belvedere (Loc. La Selva, Montegonzi, Cavriglia (Ar) Tuscany, Italy) with the bridegroom Kathryn & Steven and all their very nice guests. The ancient Tuscan villa, surrounded by centuries-old oaks, olive groves and meadows, is in the middle of a private botanical garden and has also an amphitheater and a private swimming pool inside the property. The venue is located in the Chianti region not so far from cities of Florence, Siena and Arezzo. Chianti is a charming hill-covered region surrounded by the main “art” cities in the region; the name “Chianti” is synonymous of excellent wine all around the world; geographically speaking is a hilly land that stretches for about 30 km (from North-South-Southeast) and there are 5 rivers that cross and define the area with: the Pesa, Greve, Ombrone, Staggia and Arbia rivers. During the aperitifs a talented female live music duo has entertained the guests playing an amazing unplugged repertoire. As soon as they finished, Guty & Simone have taken their place and set up under the big trees. During the dinner they played some background music and provided two wireless microphones for the speeches managed by the two best men!! 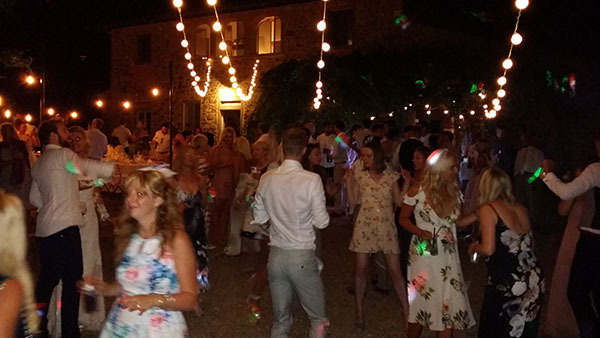 Then they played an eclectic repertoire of live music and Dj set for the after dinner party – every single song was previously agreed with the bride and groom; they added at the moment also some songs requested “on the fly” by some of the guests. The weather was good and it was a warm summer evening so, at the end of the party, some of the guests dived into the pool to cool off! !